The Ohio River is a 981-mile (1,579 km) long river in the midwestern United States that flows southwesterly from western Pennsylvania south of Lake Erie to its mouth on the Mississippi River at the southern tip of Illinois. It is the second largest river by discharge volume in the United States and the largest tributary by volume of the north-south flowing Mississippi River that divides the eastern from western United States. The river flows through or along the border of six states, and its drainage basin includes parts of 15 states. Through its largest tributary, the Tennessee River, the basin includes several states of the southeastern U.S. It is the source of drinking water for three million people. The widest point on the Ohio River is just north of downtown Louisville, where it is one mile (1.6 km) wide. The lower Ohio River just below Louisville is obstructed by rapids known as the Falls of the Ohio where the water level falls 26ft. in 2 miles and is impassible for navigation. The McAlpine Locks and Dam, a shipping canal bypassing the rapids, now allows commercial navigation from the Forks of the Ohio at Pittsburgh to the Port of New Orleans at the mouth of the Mississippi on the Gulf of Mexico. The name "Ohio" comes from the Seneca, Ohi:yo', lit. "Good River". Discovery of the Ohio River may be attributed to English explorers from Virginia in the latter half of the 17th century. In his Notes on the State of Virginia published in 1781–82, Thomas Jefferson stated: "The Ohio is the most beautiful river on earth. Its current gentle, waters clear, and bosom smooth and unbroken by rocks and rapids, a single instance only excepted." In the late 18th century, the river was the southern boundary of the Northwest Territory. It became a primary transportation route for pioneers during the westward expansion of the early U.S. The river is sometimes considered as the western extension of the Mason–Dixon Line that divided Pennsylvania from Maryland, and thus part of the border between free and slave territory, and between the Northern and Southern United States or Upper South. Where the river was narrow, it was the way to freedom for thousands of slaves escaping to the North, many helped by free blacks and whites of the Underground Railroad resistance movement. The Ohio River is a climatic transition area, as its water runs along the periphery of the humid subtropical and humid continental climate areas. It is inhabited by fauna and flora of both climates. In winter, it regularly freezes over at Pittsburgh but rarely farther south toward Cincinnati and Louisville. At Paducah, Kentucky, in the south, near the Ohio's confluence with the Mississippi, it is ice-free year-round. The name "Ohio" comes from the Seneca language (an Iroquoian language), Ohi:yo' (roughly pronounced oh-hee-yoh, with the vowel in "hee" held longer), a proper name derived from ohiːyoːh ("good river"), therefore literally translating to "Good River". "Great river" and "large creek" have also been given as translations. Native Americans, including the Lenni Lenape and Iroquois, considered the Ohio and Allegheny rivers as the same, as is suggested by a New York State road sign on Interstate 86 that refers to the Allegheny River also as Ohi:yo'; the Geographic Names Information System lists O-hee-yo and O-hi-o as variant names for the Allegheny. An earlier Miami-Illinois language name was also applied to the Ohio River, Mosopeleacipi ("river of the Mosopelea" tribe). Shortened in the Shawnee language to pelewa thiipi, spelewathiipi or peleewa thiipiiki, the name evolved through variant forms such as "Polesipi", "Peleson", "Pele Sipi" and "Pere Sipi", and eventually stabilized to the variant spellings "Pelisipi", "Pelisippi" and "Pellissippi". Originally applied just to the Ohio River, the "Pelisipi" name later was variously applied back and forth between the Ohio River and the Clinch River in Virginia and Tennessee. In his original draft of the Land Ordinance of 1784, Thomas Jefferson proposed a new state called "Pelisipia", to the south of the Ohio River, which would have included parts of present-day Eastern Kentucky, Virginia and West Virginia. Steamboat Morning Star, a Louisville and Evansville mail packet, in 1858. The river had great significance in the history of the Native Americans, as numerous civilizations formed along its valley. For thousands of years, Native Americans used the river as a major transportation and trading route. Its waters connected communities. In the five centuries before European conquest, the Mississippian culture built numerous regional chiefdoms and major earthwork mounds in the Ohio Valley, such as Angel Mounds near Evansville, Indiana, as well as in the Mississippi Valley and the Southeast. The Osage, Omaha, Ponca and Kaw lived in the Ohio Valley, but under pressure from the Iroquois to the northeast, migrated west of the Mississippi River in the 17th century to territory now defined as Missouri, Arkansas and Oklahoma. The discovery and traversal of the Ohio River by Europeans admits of several possibilities, all in the latter half of the 17th century. Virginian Englishman Abraham Wood's trans-Appalachian expeditions between 1654 and 1664; Frenchman Robert de La Salle's putative Ohio expedition of 1669-70; and two expeditions of Virginians sponsored by Colonel Wood: the Batts and Fallam expedition of 1671, and the Needham and Arthur expedition of 1673-74. The first person to traverse the length of the river, from the headwaters of the Allegheny to its mouth on the Mississippi, was a Dutch trader from New York, Arnout Viele, in 1692. In 1749, Great Britain established the Ohio Company to settle and trade in the area. Exploration of the territory and trade with the Indians in the region near the Forks brought British colonials from both Pennsylvania and Virginia across the mountains, and both colonies claimed the territory. The movement across the Allegheny Mountains of British settlers and the claims of the area near modern day Pittsburgh led to conflict with the French, who had forts in the Ohio River Valley. This conflict was called the French and Indian War. In 1763, following the war, France ceded the area to Britain, and thus to the settlers in the colonies of Britain. The 1768 Treaty of Fort Stanwix opened Kentucky to colonial settlement and established the Ohio River as a southern boundary for American Indian territory. In 1774, the Quebec Act restored the land east of the Mississippi River and north of the Ohio River to Quebec, in effect making the Ohio the southern boundary of Canada. This appeased the Canadian British subjects but angered the Thirteen Colonies. Lord Dunmore's War south of the Ohio river also contributed to giving the land north to Quebec to stop further encroachment of the British colonials on native land. During the American Revolution, in 1776 the British military engineer John Montrésor created a map of the river showing the strategic location of Fort Pitt, including specific navigational information about the Ohio River's rapids and tributaries in that area. However, the Treaty of Paris (1783) gave the entire Ohio Valley to the United States. Built between 1847 and 1849, the Wheeling Suspension Bridge was the first bridge across the river and a crucial part of the National Road. The economic connection of the Ohio Country to the East was significantly increased in 1818 when the National Road being built westward from Cumberland, Maryland reached Wheeling, Virginia (now West Virginia), providing an easier overland connection from the Potomac River to the Ohio River. The Wheeling Suspension Bridge was built over the river at Wheeling from 1847 to 1849, making the trip west easier. For a brief time, until 1851, it was the world's largest suspension bridge. Fortunately, the bridge was not blown up during the American Civil War. The bridge has been improved in 1859 and 1872, and remains in use as the oldest vehicular suspension bridge in the U.S.
Louisville was founded in 1779 at the only major natural navigational barrier on the river, the Falls of the Ohio. The Falls were a series of rapids where the river dropped 26 feet (7.9 m) in a stretch of about 2 miles (3.2 km). In this area, the river flowed over hard, fossil-rich beds of limestone. The first locks on the river – the Louisville and Portland Canal – were built to circumnavigate the falls between 1825 and 1830. Fears that Louisville's transshipment industry would collapse proved ill-founded: the increasing size of steamships and barges on the river meant that the outdated locks could only service the smallest vessels until well after the Civil War. The U.S. Army Corps of Engineers improvements were expanded again in the 1960s, forming the present-day McAlpine Locks and Dam. Because the Ohio River flowed westward, it became a convenient means of westward movement by pioneers traveling from western Pennsylvania. After reaching the mouth of the Ohio, settlers would travel north on the Mississippi River to St. Louis, Missouri. There, some continued on up the Missouri River, some up the Mississippi, and some further west over land routes. In the early 19th century, river pirates such as Samuel Mason, operating out of Cave-In-Rock, Illinois, waylaid travelers on their way down the river. They killed travelers, stealing their goods and scuttling their boats. The folktales about Mike Fink recall the keelboats used for commerce in the early days of American settlement. The Ohio River boatmen were the inspiration for performer Dan Emmett, who in 1843 wrote the song "The Boatman's Dance". Trading boats and ships traveled south on the Mississippi to New Orleans, and sometimes beyond to the Gulf of Mexico and other ports in the Americas and Europe. This provided a much-needed export route for goods from the west, since the trek east over the Appalachian Mountains was long and arduous. The need for access to the port of New Orleans by settlers in the Ohio Valley is one of the factors that led to the Louisiana Purchase in 1803. Because the river is the southern border of Ohio, Indiana, and Illinois, it was part of the border between free states and slave states in the years before the American Civil War. The expression "sold down the river" originated as a lament of Upper South slaves, especially from Kentucky, who were shipped via the Ohio and Mississippi to cotton and sugar plantations in the Deep South. Before and during the Civil War, the Ohio River was called the "River Jordan" by slaves crossing it to escape to freedom in the North via the Underground Railroad. More escaping slaves, estimated in the thousands, made their perilous journey north to freedom across the Ohio River than anywhere else across the north-south frontier. Harriet Beecher Stowe's Uncle Tom's Cabin, the bestselling novel that fueled abolitionist work, was the best known of the anti-slavery novels that portrayed such escapes across the Ohio. The times have been expressed by 20th-century novelists as well, such as the Nobel Prize-winning Toni Morrison, whose novel Beloved was adapted as a film of the same name. She also composed the libretto for the opera Margaret Garner (2005), based on the life and trial of an enslaved woman who escaped with her family across the river. The colonial charter for Virginia defined its territory as extending to the north shore of the Ohio, so that the riverbed was "owned" by Virginia. Where the river serves as a boundary between states today, Congress designated the entire river to belong to the states on the east and south, i.e., West Virginia and Kentucky at the time of admission to the Union, that were divided from Virginia. Thus Wheeling Island, the largest inhabited island in the Ohio River, belongs to West Virginia, although it is closer to the Ohio shore than to the West Virginia shore. Kentucky brought suit against Indiana in the early 1980s because of the building of the Marble Hill nuclear power plant in Indiana, which would have discharged its waste water into the river. The U.S. Supreme Court held that Kentucky's jurisdiction (and, implicitly, that of West Virginia) extended only to the low-water mark of 1793 (important because the river has been extensively dammed for navigation, so that the present river bank is north of the old low-water mark.) Similarly, in the 1990s, Kentucky challenged Illinois' right to collect taxes on a riverboat casino docked in Metropolis, citing its own control of the entire river. A private casino riverboat that docked in Evansville, Indiana, on the Ohio River opened about the same time. Although such boats cruised on the Ohio River in an oval pattern up and down, the state of Kentucky soon protested. Other states had to limit their cruises to going forwards, then reversing and going backwards on the Indiana shore only. Both Illinois and Indiana have long since changed their laws to allow riverboat casinos to be permanently docked, with Illinois changing in 1999 and Indiana in 2002. Silver Bridge in Point Pleasant, West Virginia which collapsed into the Ohio River on December 15, 1967, killing 46 persons. The Silver Bridge at Point Pleasant, West Virginia collapsed into the river on December 15, 1967. The collapse took the lives of 46 people who had been crossing on the bridge at the moment of its failure. The bridge had been built in 1929, and by 1967 was carrying too heavy a load for its design. The bridge was rebuilt about one mile downstream and in service as the Silver Memorial Bridge in 1969. In the early 1980s, the Falls of the Ohio National Wildlife Conservation Area was established at Clarksville, Indiana. The Ohio River was polluted with hundreds of thousands of pounds of PFOA, a fluoride-based chemical used in making teflon among other things, by DuPont chemical company from an outflow pipe at its Parkersburg, WV, facility for several decades beginning in the 1950s. 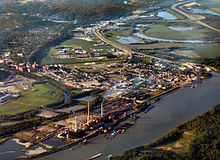 The Ohio River is heavily industrialized and populated and sees traffic from large barge cargoes carrying oil, steel and other industrial goods. There are several major cities located along the northern and southern banks of the river including Cincinnati, Ohio; Pittsburgh, Pennsylvania; and Louisville, Kentucky. 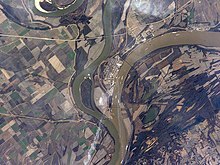 The confluence of the Mississippi and Ohio rivers is at Cairo, Illinois. The combined Allegheny-Ohio river is 1,310 miles (2,110 km) long and carries the largest volume of water of any tributary of the Mississippi. The Indians and early explorers and settlers of the region also often considered the Allegheny to be part of the Ohio. The forks (the confluence of the Allegheny and Monongahela rivers at what is now Pittsburgh) were considered a strategic military location. The Ohio River is formed by the confluence of the Allegheny and Monongahela rivers at Point State Park in Pittsburgh, Pennsylvania. From there, it flows northwest through Allegheny and Beaver counties, before making an abrupt turn to the south-southwest at the West Virginia–Ohio–Pennsylvania triple-state line (near East Liverpool, Ohio; Chester, West Virginia; and Ohioville, Pennsylvania). From there, it forms the border between West Virginia and Ohio, upstream of Wheeling, West Virginia. Natural-color satellite image of the Wabash-Ohio confluence. The river then follows a roughly southwest and then west-northwest course until Cincinnati, before bending to a west-southwest course for most of its length. The course forms the northern borders of West Virginia and Kentucky; and the southern borders of Ohio, Indiana and Illinois, until it joins the Mississippi River at the city of Cairo, Illinois. Where the Ohio joins the Mississippi is the lowest elevation in the state of Illinois, at 315 feet (96 m). The Ohio River drains to the Mississippi River which flows to the Gulf of Mexico on the Atlantic Ocean. Among rivers wholly or mostly in the United States, it is the second largest by discharge volume, the tenth longest and has the eighth largest drainage basin. It is considered to separate Midwestern Great Lakes states from the Upper South states, which were historically border states in the Civil War. The Ohio River is a left (east) and largest tributary by volume of the Mississippi River in the United States. At the confluence, the Ohio is considerably bigger than the Mississippi, measured by long-term mean discharge. The Ohio River at Cairo is 281,500 cu ft/s (7,960 m3/s); and the Mississippi River at Thebes, Illinois, which is upstream of the confluence, is 208,200 cu ft/s (5,897 m3/s). The Ohio River flow is higher than that of the Mississippi River so hydrologically, the Ohio River is the main stream of the river system. Lawrenceburg, Indiana, is one of many towns that use the Ohio as a shipping avenue. The Ohio River is a naturally shallow river that was artificially deepened by a series of dams. The natural depth of the river varied from about 3 to 20 feet (0.91 to 6.10 m). The dams raise the water level and have turned the river largely into a series of reservoirs, eliminating shallow stretches and allowing for commercial navigation. From its origin to Cincinnati, the average depth is approximately 15 feet (5 m). The largest immediate drop in water level is below the McAlpine Locks and Dam at the Falls of the Ohio at Louisville, Kentucky, where flood stage is reached when the water reaches 23 feet (7 m) on the lower gauge. However, the river's deepest point is 168 feet (51 m) on the western side of Louisville, Kentucky. From Louisville, the river loses depth very gradually until its confluence with the Mississippi at Cairo, Illinois, where it has an approximate depth of 19 feet (6 m). The water levels for the Ohio River from Smithland Lock and Dam to Cairo, Illinois, are predicted by the National Oceanic and Atmospheric Administration's Lower Mississippi River Forecast Center. Great Miami River 161 mi. Little Kanawha River 160 mi. The Ohio's drainage basin covers 189,422 square miles (490,600 km2), encompassing the easternmost regions of the Mississippi Basin. The Ohio drains parts of 15 states in four regions. New York: a small area of the southern border along the headwaters of the Allegheny. Pennsylvania: a corridor from the southwestern corner to north central border. Maryland: a small corridor along the Youghiogheny River on the western border. West Virginia: all but the Eastern Panhandle. Kentucky: all but a small part in the extreme west drained directly by the Mississippi. Tennessee: all but a small part in the extreme west drained directly by the Mississippi, and a very small area in the southeastern corner which is drained by the Conasauga River. Virginia: most of southwest Virginia. North Carolina: the western quarter. Indiana: all but the northern area. Georgia: the far northwest corner. South Carolina: less than 1 square mile in the northwest. The Ohio River is a climatic transition area, as its water runs along the periphery of the humid continental and humid subtropical climate areas. It is inhabited by fauna and flora of both climates. In winter, it regularly freezes over at Pittsburgh but rarely farther south toward Cincinnati and Louisville. At Paducah, Kentucky, in the south, at the Ohio's confluence with the Tennessee River, it is ice-free year-round. From a geological standpoint, the Ohio River is young. Before the river was created, large parts of North America were covered by water forming a saltwater lake about 200 miles across and 400 miles in length. The bedrock of the Ohio Valley was mostly set during this time. The river formed on a piecemeal basis beginning between 2.5 and 3 million years ago. The movement of glaciers during the earliest ice ages the present day river drainages of the Kanawha, Sandy, Kentucky, Green, Cumberland and Tennessee rivers northward created the Ohio system and the course of early tributaries of the Ohio River, including the Monongahela and the Allegheny rivers, were set. The Teays River was the largest of these rivers. The modern Ohio River flows within segments of the ancient Teays. The ancient rivers were rearranged or consumed. The section of the river that runs southwest from Pittsburgh to Cairo, Illinois is around tens of thousands of years old. The upper Ohio River formed when one of the glacial lakes overflowed into a south-flowing tributary of the Teays River. Prior to that event, the north-flowing Steubenville River (no longer in existence) ended between New Martinsville and Paden City, West Virginia. The south-flowing Marietta River (no longer in existence) ended between the present-day cities. The overflowing lake carved through the separating hill and connected the rivers. The floodwaters enlarged the small Marietta valley to a size more typical of a large river. The new large river subsequently drained glacial lakes and melting glaciers at the end of the ice ages. The valley grew during and following the ice age. Many small rivers were altered or abandoned after the upper Ohio River formed. Valleys of some abandoned rivers can still be seen on satellite and aerial images of the hills of Ohio and West Virginia between Marietta, Ohio, and Huntington, West Virginia. The middle Ohio River formed in a manner similar to formation of the upper Ohio River. A north-flowing river was temporarily dammed by natural forces southwest of present-day Louisville, creating a large lake until the dam burst. A new route was carved to the Mississippi. Eventually the upper and middle sections combined to form what is essentially the modern Ohio River. Along the banks of the Ohio are some of the largest cities in their respective states:[note 1] Pittsburgh, the largest city on the river and second-largest city in Pennsylvania; Cincinnati, the third-largest city in Ohio; Louisville, the largest city in Kentucky; Evansville, the third-largest city in Indiana; Owensboro, the fourth-largest city in Kentucky; Huntington, the second-largest city in West Virginia; Parkersburg, the fourth-largest city in West Virginia; and Wheeling, the fifth-largest city in West Virginia. Only Illinois, among the border states, has no significant cities on the river. There are hundreds of other cities, towns, villages and unincorporated populated places on the river, most of them very small. Cities along the Ohio are also among the oldest cities in their respective states and among the oldest cities in the United States west of the Appalachian Mountains (by date of founding): Pittsburgh, Pennsylvania, 1758; Wheeling, West Virginia, 1769; Huntington, West Virginia, 1775; Louisville, Kentucky, 1779; Clarksville, Indiana, 1783; Maysville, Kentucky, 1784; Martin's Ferry, Ohio, 1785; Marietta, Ohio, 1788; Cincinnati, Ohio, 1789; Manchester, Ohio, 1790; and Beaver, Pennsylvania, 1792. Other cities of interest include Cairo, Illinois, at the mouth of the Ohio on the Mississippi River and the southernmost and westernmost city on the river; Pittsburgh, Pennsylvania, the easternmost city on the river at the head or Forks of the Ohio, where the Allegheny and Monongahela Rivers join to create the Ohio; and Beaver, Pennsylvania, the site of colonial Fort McIntosh and the northernmost city on the river. It is 548 miles as the crow flies between Cairo and Pittsburgh, but 981 miles by water. Direct water travel the length of the river is obstructed by the Falls of the Ohio just below Louisville, Kentucky. The Ohio River Scenic Byway follows the Ohio River through Illinois, Indiana and Ohio ending at Steubenville, Ohio, on the river. Before there were cities, there were colonial forts. These forts played a dominant role in the French and Indian War, Northwest Indian War and pioneering settlement of Ohio Country. Many cities got their start at or adjacent to the forts. Most were abandoned by 1800. Forts along the Ohio river include Fort Pitt (Pennsylvania), Fort McIntosh (Pennsylvania), Fort Randolph (West Virginia), Fort Henry (West Virginia), Fort Harmar (Ohio), Fort Washington (Ohio), and Fort Nelson (Kentucky). Short-lived special purpose forts included Fort Steuben (Ohio), Fort Finney (Indiana), Fort Finney (Ohio) and Fort Gower (Ohio). 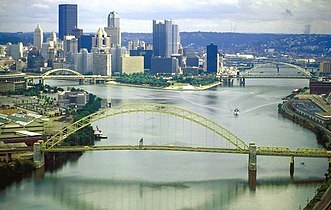 The Allegheny River, left, and Monongahela River join to form the Ohio River at Pittsburgh, Pennsylvania, the largest metropolitan area on the river. Louisville, Kentucky, The deepest point of the Ohio River is a scour hole just below Cannelton locks and dam (river mile 720.7). A barge hauls coal in the Louisville and Portland Canal, the only artificial portion of the Ohio River. Cincinnati skyline showing the John A. Roebling Suspension Bridge to Covington, Kentucky. Carl Perkins Bridge in Portsmouth, Ohio with Ohio River and Scioto River tributary on right. ^ Cities and towns of pop. at least 25,000 and among the 10 largest in the state, and whose municipal boundary comes within less than a mile of the river. Florence, KY, a city of 33,500 and 8th largest in KY, for example, is a near miss because its northernmost boundary only comes within 2.7 miles of the river. ^ a b c Leeden, Frits van der; Troise, Fred L.; Todd, David Keith (1990). The Water Encyclopedia (Second ed.). Chelsea, Michigan: Lewis Publishers. p. 126. ISBN 978-0-87371-120-3. ^ a b Bright, William (2004). Native American Placenames of the United States. University of Oklahoma Press. p. 344. ISBN 978-0-8061-3598-4. Retrieved April 11, 2011. ^ Jefferson, Thomas, 1743–1826. Notes on the State of Virginia Archived August 29, 2013, at the Wayback Machine; the single instance refers to the former rapids near Louisville. ^ Stewart, George R. (1967). Names on the Land. Boston, Massachusetts: Houghton Mifflin Company. p. 8. ISBN 978-0-938530-02-2. ^ "Allegheny River". Geographic Names Information System. United States Geological Survey. Retrieved May 13, 2010. ^ a b "The Winding River Home: Pellissippi State researches the meaning of 'Pellissippi'". Pellissippi State News. Pellissippi State Community College. June 7, 2017. Archived from the original on July 26, 2018. Retrieved July 26, 2018. ^ "Shawnees Webpage". Shawnee's Reservation. 1997. Archived from the original on June 30, 2013. Retrieved April 26, 2013. ^ "Ohio River | river, United States". Encyclopedia Britannica. Retrieved February 2, 2019. ^ * Taylor, Alan (2006). The Divided Ground: Indians, Settlers, and the Northern Borderland of the American Revolution. New York: Alfred A. Knopf. p. 44, see map on 39. ISBN 978-0-679-45471-7. ^ Montrésor, John (1776). "Map of the Ohio River from Fort Pitt". World Digital Library. Pennsylvania. Retrieved July 1, 2013. ^ Fowler, Thaddeus Mortimer (1906). "Bird's Eye View of Cumberland, Maryland 1906". World Digital Library. Retrieved July 22, 2013. ^ "Geography". KET's Underground Railroad: Passage to Freedom, with Kentucky Humanities Association. Retrieved December 19, 2018. ^ Dunaway, Wilma A. (2000). "Put in Master's Pocket: Interstate Slave Trading and the Black Appalachian Diaspora" (DOC). In Inscoe, John C. (ed.). Appalachians and Race: The Mountain South from Slavery to Segregation. University Press of Kentucky. pp. 5–6. ISBN 978-0813121734. Retrieved December 19, 2018. Bluegrass dealers made a business of buying up Negroes at auction sales and shipping them down to New Orleans to be sold to owners of cotton and sugar cane plantations. . . . This practice gave rise to the expression 'sold down the river. ^ Hudson, J. Blaine. "Crossing the "Dark Line": Fugitive Slaves and the Underground Railroad in Louisville and North Central Kentucky (excerpt)". KET's Underground Railroad: Passage to Freedom, with Kentucky Humanities Association. ^ LeRose, Chris (October 2001). "The Collapse of the Silver Bridge". West Virginia Historical Society Quarterly. 15 (4). ^ "Report: Ohio River most polluted in U.S." Pittsburgh Business Times. March 23, 2012. Retrieved April 24, 2012. ^ Jerry, Bruggers. "Ohio River again tops list for industrial pollution". Louisville Courier Journal. ^ Rich, Nathaniel (January 6, 2016). "The Lawyer Who Became DuPont's Worst Nightmare". New York Times. ^ "Water Data Report: 07022000 Mississippi River at Thebes, IL Summary Statistics" (PDF). US Geological Survey. Retrieved December 19, 2018. ^ "Ohio RFC". US Department of Commerce, NOAA, National Weather Service. Retrieved March 10, 2017. ^ "Lower Mississippi RFC". US Department of Commerce, NOAA, National Weather Service. Retrieved March 10, 2017. ^ a b c "Tributaries". www.orsanco.org. ^ Beck, Hylke E.; Zimmermann, Niklaus E.; McVicar, Tim R.; Vergopolan, Noemi; Berg, Alexis; Wood, Eric F. (October 30, 2018). "Present and future Köppen-Geiger climate classification maps at 1-km resolution". Scientific Data. 5: 180214. Bibcode:2018NatSD...580214B. doi:10.1038/sdata.2018.214. ISSN 2052-4463. PMC 6207062. PMID 30375988. Dunn, J. P. (December 1912). "Names of the Ohio River". The Indiana Quarterly Magazine of History. 8 (4): 166–70. JSTOR 27785389. Hay, Jerry M. (2010). Ohio River Guidebook (First ed.). Indiana Waterways. ISBN 978-1605852171. Wikimedia Commons has media related to Ohio River. "Ohio River" . Encyclopædia Britannica. 20 (11th ed.). 1911. "Ohio River" . The American Cyclopædia. 1879. "Ohio River" . New International Encyclopedia. 1905. "Ohio, a river of the United States" . The New Student's Reference Work . 1914. "Ohio, a river of the United States" . Collier's New Encyclopedia. 1921.